Money (1) – What Does the Bible Say? The Breaking of Bread – What is my part? Secular or Spiritual: Are We Dividing the Baby in Two? Each of us needs food to survive. By eating a balanced diet, the body obtains the nourishment it requires in order to function normally. When it is starved of food, organs will start to shut down until finally, it succumbs to death. It is commonly said that, “You are what you eat,” and there is a very direct relationship to what we are and what we feed upon. Spiritual food is as vital to our spiritual welfare as physical food is to the health of our physical bodies. Just as people who eat a wholesome diet enjoy better wellbeing, it is crucial to feed on the Word of God in order to “be strong in the Lord” (Eph 6:10, KJV). Similarly, as poor physical nutrition increases susceptibility to disease, impairs development and reduces productivity, so feeding my soul on junk food results in weakness, stunted growth, and spiritual poverty. In the words of C.H. Spurgeon: “Scripture reading is our spiritual meal-time.” God has given us a rich resource in His Word which we must use to feed our souls for our spiritual health and vitality. Paul, writing to Timothy, says, “Hold fast the form of sound (health-giving”) words (2Tim 1:13, KJV). Are you feeding on the Word of God? Have you fed on it today? Or are you feeding on what can only be described as junk food? I cannot expect to be a strong believer, fit for the Master’s use, if I am starving myself of spiritual food. 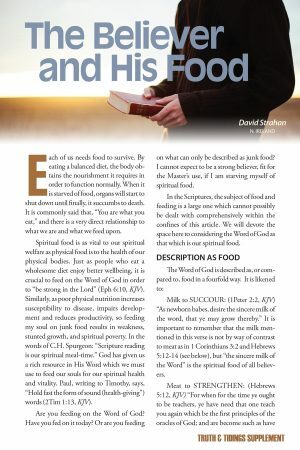 In the Scriptures, the subject of food and feeding is a large one which cannot possibly be dealt with comprehensively within the confines of this article. We will devote the space here to considering the Word of God as that which is our spiritual food. Milk to SUCCOUR: (1Peter 2:2, KJV) “As newborn babes, desire the sincere milk of the word, that ye may grow thereby.” It is important to remember that the milk mentioned in this verse is not by way of contrast to meat as in 1 Corinthians 3:2 and Hebrews 5:12-14 (see below), but “the sincere milk of the Word” is the spiritual food of all believers. Meat to STRENGTHEN: (Hebrews 5:12, KJV) “For when for the time ye ought to be teachers, ye have need that one teach you again which be the first principles of the oracles of God; and are become such as have need of milk, and not of strong meat.” The Hebrews were compared to infants who required milk and could not bear meat (solid food). This is the same thought found in 1 Corinthians 3:2 where spiritual immaturity is in view. It is a serious condition when any believer continues as an infant, able only to receive milk when they should be eating solid food. Honey to SWEETEN: The Psalmist David says that the Word of God is “More to be desired … than gold, yea, than much fine gold” (Psa 19:10, KJV). His Words are priceless in their value and sweeter than honey to his taste: “Sweeter also than honey and the honeycomb” (Psa 19:10, KJV; see also Psalm 119:103). Jeremiah describes the Word of God as that which he ate: “Thy words were found, and I did eat them; and Thy word was unto me the joy and rejoicing of mine heart” (Jer 15:16, KJV). A well-fed believer is full of the joy of the Lord! Ensure you don’t limit your intake of food to a particular portion or aspect of the Word of God. Often believers have favorite portions or themes but the canon of scripture, in its entirety, is given for our spiritual development and is all necessary (2Tim 3:16-17). The Bible introduces the figure of a newborn babe to illustrate that every person who is born of God will have a desire for His Word. “As newborn babes, desire the sincere milk of the word” (1 Peter 2:2, KJV). The desire for milk in the infant is instinctive and continual. A child does not need to be taught to desire milk. So every believer should instinctively crave the sincere (or guileless, pure) milk of the Word of God. The Word of God provides all the essential food required to live and grow spiritually, as a mother’s milk contains all the vital nutrients for the newborn babe. At the moment of conversion, we were “born again, not of corruptible seed, but of incorruptible, by the Word of God, which liveth and abideth for ever” (1Peter 1:23, KJV). His Word brought us spiritual enlightenment at conversion, and it is by that same Word that we continue to be fed as Christians. However, while every child born of God has an instinctive desire for the Word, this must also be cultivated. The more we feed upon it, the more we will desire it. Just as physical nourishment is an ongoing daily activity, we also need a daily diet of spiritual food for our spiritual progress. Job knew the importance of feeding on the Word of God: “I have esteemed the words of His mouth more than my necessary food” (Job 23:12b, KJV). He esteemed spiritual food, “the words of His mouth,” as greater provision than the food he required for physical life. The word “esteemed” is often used for concealing or laying up treasures so that they are safe. The same word is used in Psalm 119:11; “Thy word have I hid in mine heart.” Although it is good to read the Word of God, it must also be hid in our hearts “that I might not sin against Thee” (Psa 119:11, KJV). Can this be said of us? How long do you spend feeding your soul on the Word of God? If you spent the same time each day satisfying your physical appetite as you do feeding on the Scriptures, would you be losing or gaining weight? In addition to needing the discipline of feeding on the Word on a regular and daily basis, the believer must also involve his or her entire self in this activity. Psalm 119 teaches us that feeding on the Word of God affects the complete person. The theme of this Psalm is the preciousness and purpose of the Word of God. In it we learn the value of the Word and the results of obeying it. It is obvious in the natural realm that a child’s physical growth and development is related to the adequacy of their dietary intake. Feeding on the Word of God will inevitably lead to evidence of spiritual growth and development. This is the teaching of 1 Peter 2:2: “that ye may grow thereby” (KJV). Just as the face of Moses shone when he came down the mount (Exo 34:29) and just as Ruth carried the visible testimony of her gleaning with her into the city (Ruth 2:18), so spiritual development resulting from feeding on the Word of God will be visible to discerning and spiritual believers. Take time to be holy, the world rushes on. In the example of Job mentioned previously, we see that, beyond esteeming “the words of His mouth” (Job 23:12b, KJV), he also embraced the Word, and did not depart or turn aside from “the commandment of His lips” (Job 23:12a, KJV). This is the secret of spiritual growth – it is not only being hearers of His Word, but doers also (James 1:22). Often, the reason we do not make the spiritual progress that we should is not because we have not read – or that we do not know – the Word of God, but rather that we fail to obey it. When reading the Scriptures, it is good to cultivate a prayerful and humble spirit so that we might apply it to our lives. It was Peter’s desire that believers would “grow in grace, and in the knowledge of our Lord and Savior Jesus Christ” (2Peter 3:18, KJV). The more we grow and develop as Christians, the more Christ-like we will become. And die to all the things of time. The food we consume for our physical bodies needs to be digested in order to benefit us. Often indigestion is caused by eating too fast, and the nourishment from the food is not properly broken down and absorbed to meet our body’s need. When it comes to the matter of feeding on the Word of God there is no “fast-food,” that is, there are no shortcuts and no quick answers. The Word must not only be read – that is important and good – but it should be meditated upon. To meditate means to ponder, muse and reflect upon what has been read. By meditating upon the Word, we learn what it says, what it means, and how we should apply it to our lives. It is crucial to take time to absorb and digest the Word. This involves uninterrupted time set aside on a daily basis, in a place free from distraction, to adequately feed my soul. Although it is the responsibility of every believer to ensure that they are feeding on the Word of God, there is also a responsibility placed on elders to ensure that the saints are fed. Writing in his first epistle, Peter exhorts the elders to “Feed the flock of God which is among you” (1Peter 5:2, KJV). Paul uses the same word, “feed,” when addressing the Ephesian elders in Acts 20. While this word means more than just the provision of food (it covers the whole thought of tending and shepherding), it encompasses the exhortation to nourish and feed. In the natural realm, it would be unthinkable that a shepherd would not provide food for his sheep. Elders are likewise required to ensure that the saints under their care have spiritual food to feed upon. That is why one of the requirements of the elder is that he must be “Apt to teach” (1Tim 3:2, KJV). Generally speaking, we eat foods we enjoy and we are satisfied. Feeding on the Word should not be approached as a task which needs to be done each day, but rather it should be “the joy and rejoicing” (Jer 15:16, KJV) of our hearts. As you feed on the Scriptures, may they delight and strengthen your soul. They have been given by the Lord Himself. “I have given them Thy word” (John 17:14, KJV). Look for Him on every page. May we ever be found feeding and drawing on the inexhaustible supply of the Word of God.